Alter-ego Chris Gaines on the left, original persona Garth Brooks on the right. Inspired by Garth Brooks’ recent announcement of his world tour, we thought we’d take a minute to look back on our favorite era of Garth-ness: the invention of Brooks’ alter-ego, Chris Gaines. Alter-egos help an artist feel free to express sides of their persona that might make their fans uncomfortable otherwise. When we see an artist as just a ballad singer or just a rapper or just a pretty pop star, the artist often feels the need to rebel in the form of an alter-ego. David Bowie had multiple alter-egos. Most notably, he posed as Ziggy Stardust, space-age rock superstar. (Not really a stretch.) 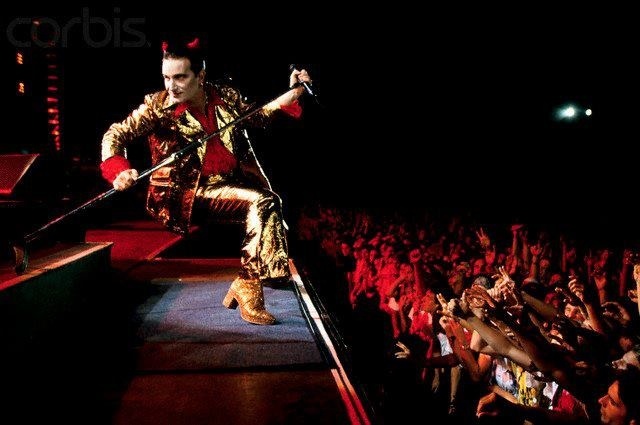 Bono from U2, ever the overachiever, had three alter-egos: The Fly, Mephisto and The Mirrorball Man. Prince had Camille. Beyonce was briefly evil Illuminati super goddess Sasha Fierce. Gaga did Jo Calderone. Mariah Carey released Mimi. Janet Jackson was Damita Jo and Strawberry. Eminem was Slim Shady. Mary J. Blige’s rap persona is called Brook Lynn, a move revived by Justin Bieber when he rapped under Shawty Mane. The Beatles, heroes of reinvention, found freedom from expectations while posing (and recording) as Sgt. Pepper’s Lonely Hearts Club Band. And the most current (and extreme) example of the artist / alter-ego divide is Miley Cyrus / Hannah Montana. Taking on a full alter-ego isn’t the only way to put on a new face. Many artists have flirted with this method to a lesser degree, insisting on being called other names for (usually) brief amounts of time. For example, Snoop Dogg became Snoop Lion, Sean Combs has been everything from Puff Daddy to Puffy to P. Diddy to Diddy. Paul McCartney was briefly going as Gladys Jenkins. David Johansen of the New York Dolls released music under the name Buster Poindexter. Jack White tried to go by Three Quid while touring Europe. Even Hank Williams recorded other song styles under the name Luke the Drifter. While some stars have varied levels of intensity and commitment when it comes to their alter-egos, Garth Brooks embraced the character of Chris Gaines with an intensity that was weird, off-putting and kind of thrilling. 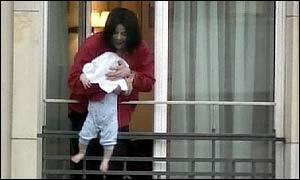 It was one of the greatest train wreck moments in pop culture history, right up there with Bald Britney and Michael Jackson dangling “Blanket” over a balcony railing. In the 1990s, Garth Brooks had been riding an unprecedented wave of success. His first album was released in 1989 and he broke nearly every music record out there for the next ten years solid. He set concert attendance records, was a best-selling artist world-wide, every album he released went platinum multiple times and he won nearly every major music award available. This is a wig… right? And then, inexplicably, in 1999 at the tail end of a decade that he just flat owned, Brooks decided to mess with the formula. In one of the most perplexing events to ever happen in pop music: Garth Brooks invented Chris Gaines. Maybe Brooks was rebelling against his success or maybe he just needed a change. But most likely, he was sick of the confines of country music. Country, like any good subculture, has its own unwritten rules about how a person should speak, what words they should use, where they should go, who they should interact with and — especially — what they should wear. Every genre has a uniform and conformity is demanded. Rappers wear gold chains and bling just like country stars wear pointed boots and cowboy hats. Brooks wore all of that plus those nut-exploding painted-on jeans and a whole series of bad rodeo wear. Maybe he was just sick of having to wear those damn obnoxious shirts? Particularly in country music, conformity is demanded and artists are expected to acquiesce or be promptly smacked down by Nashville executives. The idea of a “country crossover artist” — now presented so perfectly by Taylor Swift — was looked down upon in 1990s country music. At the time, artists like the Dixie Chicks had been labeled with the “crossover” tag, but that’s because the members didn’t dress classically country. They sure sounded country, though. So while artists and potential label signees were being told they weren’t “country” enough, Garth Brooks, the absolute King of Modern Country, threw his cowboy hat out the tractor window and went digging in his dress-up trunk. Confined by his own specific success, Brooks couldn’t just go make a pop album, he had to invent a character. Seemingly overnight, Brooks morphed into Chris Gaines, the fabricated pop singer with an invented background and an entirely different musical style and singing voice. Supposedly built as a character for a never-completed movie staring Garth Brooks, the character of Chris Gaines soon took on a life of its own, with Brooks performing, doing interviews as and even staring in a VH1 Behind the Music “documentary” as Gaines. Which obnoxious shirts? These obnoxious shirts. Gaines had flat-ironed angular black hair (a wig), a severe soul patch and terrible Eurotrash clothes. Gaines also had his own elaborate back-story with a whole big fake history of family troubles and personal problems. He was pensive, deep guy who was also supposed to be from Australia. The from Australia part was the worst decision of them all (now Brooks had to attempt to pull off an accent, too) but Brooks later said that the hardest part of being Chris Gaines was not trying on a brand new personality, but trying to look thinner. Brooks designed Gaines to be 40 pounds lighter than him, meaning that Brooks was constantly making Zoolander‘s “Blue Steel” face in Gaines photos because he was always sucking in his cheeks. Just like his inventor, eventually Gaines cracked the Billboard charts. His Babyface-esque “Lost in You” made it all the way to the Top 5. Brooks’ time as Gaines was largely seen as some symptom of a mid-life crisis or a full-fledged freak-out, but he definitely had enough talent for two artists. It was odd from top to bottom — he came off like a total nutter, and it essentially marked the end of his career as a major player in the music industry. But Brooks took the biggest risk of his career with Gaines and cheers to him for that. His rebellion wasn’t even Gaines, his rebellion was refusing to not rebel. Basically, this country guy dressing up and posing like a gothic MySpace teenager was somehow totally punk. Go Garth. Brooks retired from recording and performing for almost a decade after the Gaines Disaster but has since released a few singles, done a residency in Las Vegas and dropped a rare performance here and there. But now Brooks has put his hat back on and has scheduled a world tour. Will it be the biggest comeback of all time? Probably. Brooks already has the future of entire cities hanging on his stirrups like he’s the gosh-darn Olympic games. Garth, we know you’re really busy and all but can we make just one request? Have Chris Gaines as your tour opener. We love him. Please? Thanks.